Uptown productions will organize a fantastic event in la Coupole Bienne for New Year, two very valuable guests as DJ Food & DK will rock the night. Spinback II – 11th December 2010 ! Don’t miss our next event : Spinback 2 ! Take some funk classics, some 80s electro tunes, some oldschool hip-hop, several rock athems, put in a shaker, shake shake and you will obtain : Spinback volume 2 !!! >>>>>>>>>>>>>>>>>>>11 December 2010, Etage Club Bienne, be there !!! 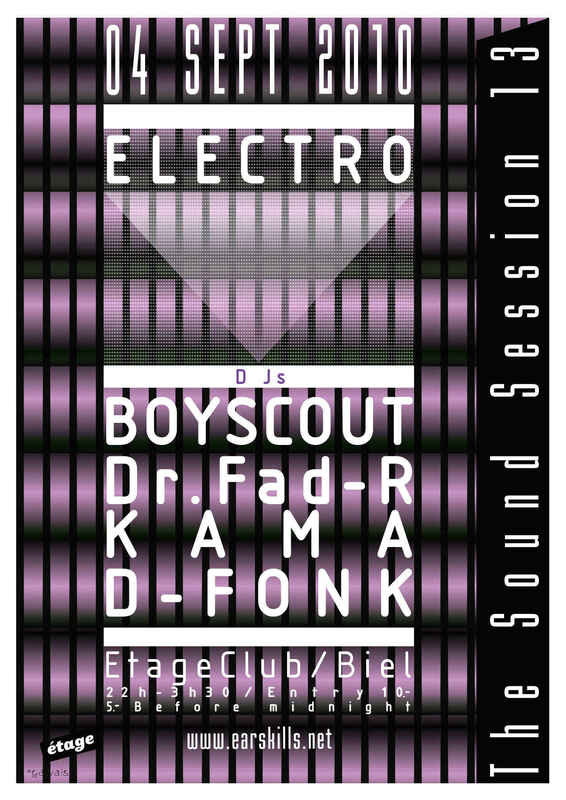 The next Sound Session in Etage-Club (Biel/Bienne) is planned on september 4th! Electro-music with various influences (house, 80’s, hip-hop, dubstep, breakbeat) for dancers and party people… We hope to see you there with big motivation (as usual)!